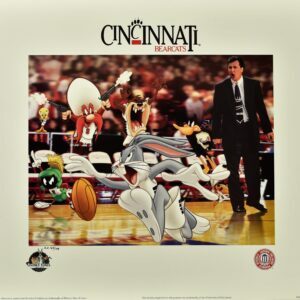 A limited edition Looney Tunes lithograph entitled “Huggs and Bugs.” This photoanimation lithograph features former University of Cincinnati’s head coach Bob Huggins coaching the Looney Tunes in a basketball game. This edition is limited to 1989 pieces with 198 Artist Proofs. 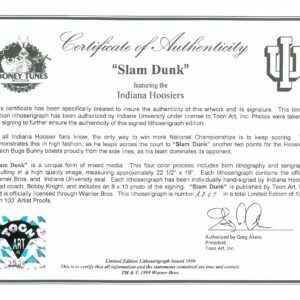 Measures 19 x 22 1/2 and comes with Certificate of Authenticity. Licensed by both Warner Bros. and the Collegiate Licensing Company. 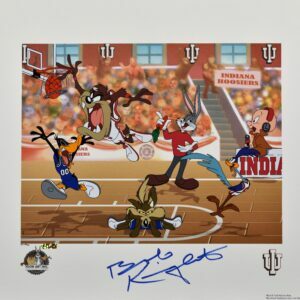 This Indiana University Hoosiers lithoserigraph is entitled “Slam Dunk.” Slam Dunk features the Looney Tunes characters dressed as Hoosier basketball players being coached by Bugs Bunny. This lithoserigraph measures 19×22 1/2 and is hand-signed by Bobby Knight. Includes a COA and an 8×10 of Knight signing. Is officially licensed by Warner Bros. and Indiana University. 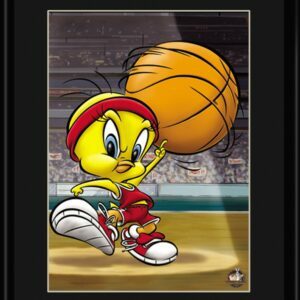 Roundball Tweety basketball lithograph featuring Looney Tunes character Tweety. Perfect for any basketball player’s room. Limited Edition. Comes matted and framed with Certificate of Authenticity. Size 11×14. 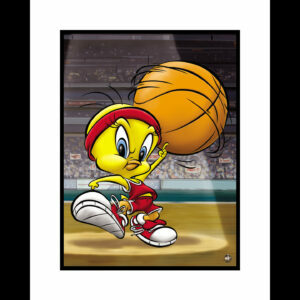 Roundball Tweety- A Fine Art Giclee featuring Looney Tunes character Tweety Bird. Perfect for any basketball fanatic’s room. Limited Edition. Comes matted and framed with Certificate of Authenticity. Size 16×20. Edition Size 500. 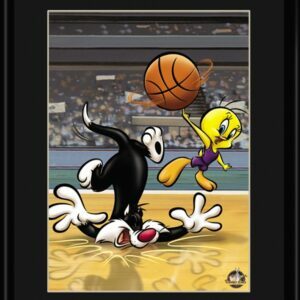 Sylvester and Tweety basketball lithograph featuring Looney Tunes characters Sylvester and Tweety. Perfect for any basketball player’s room. Limited Edition. Comes matted and framed with Certificate of Authenticity. Size 11×14. 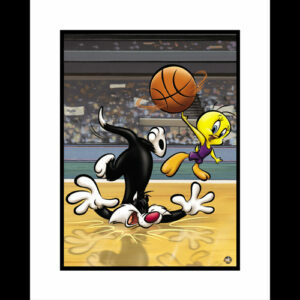 Sylvester and Tweety Basketball- A Fine Art Giclee featuring Looney Tunes characters Tweety and Sylvester. 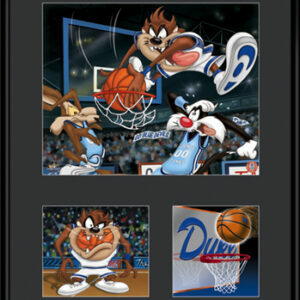 Perfect for any basketball fanatic’s room. Limited Edition. Comes matted and framed with Certificate of Authenticity. Size 16×20. Edition Size 500. “Giclée,” as a fine art term, has come to be associated with prints using fade-resistant “archival” inks (including solvent inks) and the inkjet printers that use them. These printers use the CMYK color process but may have multiple cartridges for variations of each color based on the CcMmYK color model .